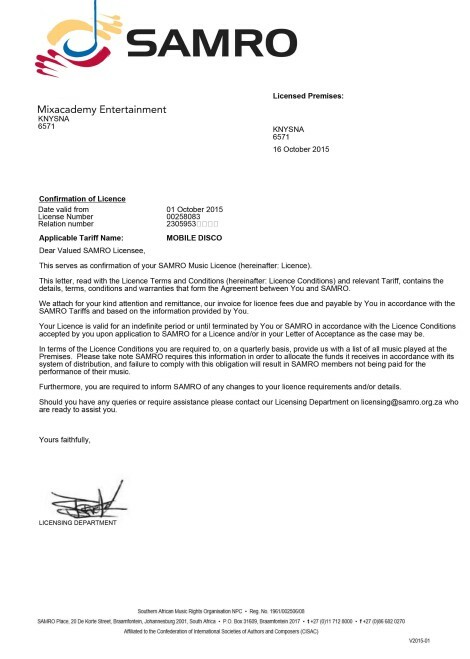 SAMRO requires most performers and establishments to be SAMRO registered in order to pass the relevant loyalties onto the composers of the music we enjoy so much! We understand what it takes to be someone in the music industry and have always promoted our producers / singers / songwriters as well as their music, so it makes sense to do the right thing by paying our dues to the entertainment industry governing body. We are approved SAMRO Music User License Holders – we have uploaded a copy of our license for your perusal so you can be at ease that we pay our dues to the original artists of the music we play for your entertainment! Please don’t hesitate to contact us if you have an questions whatsoever on this!